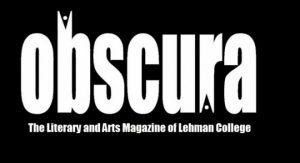 Editors of the student-run literary magazine, Obscura, will hold a special launch party to celebrate the release of a seventh volume on Wednesday, May 4, at 2:30 p.m. in the Lehman College Art Gallery. Students and alumni will read excerpts from the latest issue, which explores themes of identity, betrayal, love, and faith. This year’s volume includes the much-anticipated follow-up to last year’s short story “Problematic Quinn” by Stephanie Trinidad, and long poem “Castor and Pollux” by Christopher Wilson, inspired by the famous Greek myth. In Obscura, students work all year, starting in the fall semester gathering potential submissions and collecting them by winter break. Artists are then paired with student editors who work closely together throughout the spring semester to refine the work for inclusion in the next annual volume. Seven years ago, Obscura was a defunct and little-known literary magazine. It owes its rebirth to Terrence Cheng, a former chair of the English Department, who felt there was no where to showcase the works of his talented students. He reminisced about his own experience in college working on a student-run magazine, so he set out to fill the void at Lehman. Cheng found the remnants of a decades-old publication that had changed its name and layouts a number of times. Although there wasn’t much to work from, Cheng took the opportunity to re-establish Obscura Literary Magazine by securing funding and using a personal friend who works as a graphic designer to initiate the beginning of a revitalized student magazine. Once the groundwork was laid, the students took over. They had the task of recruiting members, securing contributors, selecting materials, editing works, budgeting the publication, and organizing the launch event. The first volume in 2009 was filled with provoking poetry, exciting stories, captivating photography, and illuminating artwork. It’s a tradition that can be seen in the current volume. “Obscura has given me the opportunity to not only work with some amazing people but also to understand how hard it is to put together a literary magazine that is filled with great content,” says Stephanie Trinidad, whose own work is prominently featured in Volume 7. 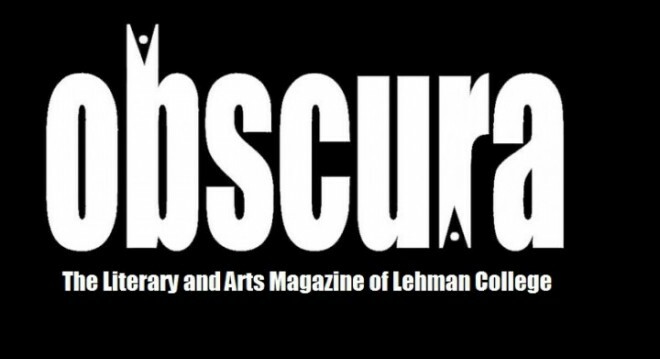 In addition to the print magazine, Obscura can be found online at obscuralitmag.wordpress.com. There are also bi-weekly blogs featuring reviews from previous volumes, upcoming events, advice on writing and reading techniques, and feedback on literature assigned by Lehman English professors. Obscura Literary Magazine is open to all students. For more information e-mail lehmanlitmag@gmail.com.